Now, brethren, concerning the coming of our Lord Jesus Christ and our gathering together to Him, we ask you 2 not to be soon shaken in mind or troubled, either by spirit or by word or by letter, as if from us, as though the day of Christ had come. 3 Let no one deceive you by any means; for that Day will not come unless the falling away comes first, and the man of sin is revealed, the son of perdition, 4 who opposes and exalts himself above all that is called God or that is worshiped, so that he sits as God in the temple of God, showing himself that he is God. 5 Do you not remember that when I was still with you I told you these things? 6 And now you know what is restraining, that he may be revealed in his own time. 7 For the mystery of lawlessness is already at work; only he who now restrains will do so until he is taken out of the way. 8 And then the lawless one will be revealed, whom the Lord will consume with the breath of His mouth and destroy with the brightness of His coming. 9 The coming of the lawless one is according to the working of Satan, with all power, signs, and lying wonders, 10 and with all unrighteous deception among those who perish, because they did not receive the love of the truth, that they might be saved. 11 And for this reason God will send them strong delusion, that they should believe the lie, 12 that they all may be condemned who did not believe the truth but had pleasure in unrighteousness. Looking at Paul’s first letter to the Thessalonians, he wrote to a church that was experiencing persecution (II Thess. 1:4-7). Paul spoke of their “persecutions and tribulations,” but also their patience, faith, and endurance (verse 4). He spoke of their suffering and troubles (verses 5-6), but also promised that those who troubled them would be repaid with tribulation (verse 6) and that they would receive rest “when the Lord Jesus is revealed from heaven with His mighty angels, in flaming fire taking vengeance on those who do not know God” (verses 7-8). If this prophecy is still not fulfilled, as many believe and teach today, then none of those believers lived to experience that relief. Also those who troubled them have not yet been repaid with tribulation, according to this idea. “For you, brothers and sisters, became imitators of God’s churches in Judea, which are in Christ Jesus: You suffered from your own people the same things those churches suffered from the Jews who killed the Lord Jesus and the prophets and also drove us out. They displease God and are hostile to everyone in their effort to keep us from speaking to the Gentiles so that they might be saved. In this way they always heap up their sins to the limit. The wrath of God has come upon them at last” (I Thess. 2:14-16; see also Acts 17:1-13). It’s believed that II Thessalonians was written around AD 52. Great judgment came upon the Jews 14 years later during the Jewish-Roman War (AD 66-73). When we recall the words of Jesus, it’s no surprise that Paul expected his first century readers to personally experience relief from their afflictions. Jesus had likewise promised to come in His kingdom, in judgment, with His angels, and in His Father’s glory while some of His 12 disciples were still alive (Matthew 16:27-28). Paul viewed the coming judgment upon apostate Israel as a good development for the spread of the gospel among the nations. The “man of lawlessness” and the “mystery of lawlessness” were direct concerns for the believers living in Thessalonica in Paul’s day. What was already happening in Jerusalem, and what would soon reach a crisis level, affected their lives in a significant way. David points out that the Greek word for the phrase “gathered together,” episunagoge, used in II Thess. 2:1, appears three times in the New Testament:  in Matthew 24:31 (“…and He will send out His angels with a loud trumpet call, and they will gather His elect from the four winds, from one end of heaven to the other”; see our study of this passage),  here in this passage,  and in Hebrews 10:25 (“not neglecting to meet together, as is the habit of some, but encouraging one another, and all the more as you see the Day drawing near”). Paul stated that two events had to occur before the day of the Lord would come:  the rebellion, and  the revealing of the man of lawlessness. The Greek word “apostasia” in verse 3 is rendered by most modern translations as “the rebellion” or “the revolt.” According to Strong’s Concordance, it’s a word that can mean either [a] revolt (rebellion) or [b] defection/departure (falling away). Did Paul predict a spiritual falling away? This is a popular idea, but this word can also indicate a social or political rebellion. We know from the Jewish historian Josephus and other sources that in AD 66 AD a large-scale rebellion rose up in Israel through the efforts of the Zealots, leading to Rome declaring war on Israel. This rebellion began about 14 years after Paul wrote this letter, although the seeds of that rebellion were already taking root by the time of Paul’s writings and there had been smaller outbreaks even earlier. So in verse 3, Paul made the argument that Christ’s coming in judgment against Israel would not take place before the great rebellion led by the Zealots had already begun. What is the significance of the title “man of lawlessness”? Some may be tempted to simply see this man as a reckless leader with no regard for local or international laws. However, the “law” that was held in the highest regard in Paul’s world was the Mosaic Law, the Law of Moses. It’s very likely that Paul was saying that this man would trample on the Law of Moses and freely commit sins under the law. The fact that he would sit in the temple is another clue to the meaning of “lawlessness” because the temple was central to the practice of Mosaic Law. This would also confirm that he was revealed while the law was still being practiced (Hebrews 8:13), i.e. before the temple was destroyed in AD 70. We can also note the close relationship between “lawlessness” and “rebellion” in these verses. The Zealots were about to lead a massive rebellion against Rome, and Paul’s readers knew this had been their goal for some time. So the man of lawlessness would naturally come from their ranks. Josephus, who chronicled that rebellion in Wars of the Jews, ran out of adjectives to describe how wicked it was and how profoundly the Zealots violated the Law for which they were supposed to be so zealous. Verse 4 says that the man of lawlessness “opposes and exalts himself against every so-called god or object of worship, so that he takes his seat in the temple of God, proclaiming himself to be God.” The temple known to the Thessalonians, and which was famous throughout the Roman Empire, was burned and destroyed in AD 70, only about 18 years after Paul wrote this letter. At the end of this study, we will look at what took place in the temple during its final years, and what I believe fulfilled this prophecy. Briefly, though, I would like to address the popular belief that a third temple must soon be rebuilt in Jerusalem, and that a future antichrist figure will then be enthroned in that temple. Is there any way that the Thessalonian believers would have understood Paul’s words this way? They knew from Jesus’ own prophecies that the temple (the one they knew and most likely had visited) would be destroyed in their own generation (Matthew 23:29-24:1, 24:3, 24:34; Luke 19:41-44, Luke 21:5-33, etc.). There are no clues in the text pointing to a different temple than that one being involved in this prophecy. How strange it would have been for them to think that Herod’s temple would later be replaced in order for a lawless individual to proclaim his divinity in a new temple. Even more strange would be the fact that they wouldn’t need to be concerned about him because he was many centuries away from appearing. Yet Paul clearly wrote to them about the lawless one as if he would directly impact their lives or the lives of those they cared about. Such a rebuilt temple in the 21st century would also certainly not be “the temple of God.” Those who are trying to initiate this project today are hoping to resume old covenant sacrifices, which would be a rejection of Christ and His work on the cross. It’s a tragedy that many professing Christians in America today are passionate about seeing such a project come to pass in modern Israel and have donated millions of dollars to see it happen, even though it would raise tensions and could cause a major war to break out. Paul reminded the Thessalonians that he had already discussed with them in person about the man of sin, the coming rebellion, etc. (verse 5). We are not given many details of that earlier conversation. Apparently, Paul had privately discussed with them the identity of the man of lawlessness and the entity that was restraining him, because he says, “And YOU KNOW what is restraining him NOW so that he may be revealed in his time” (verse 6). This again points to a first-century fulfillment, as does Paul’s next statement: “For the mystery of lawlessness is ALREADY at work. Only he who NOW restrains it will do so until he is out of the way” (verse 7). I would like to suggest that the “mystery of lawlessness” was a reference to the Zealot movement which had been gaining steam since Hezekiah the Zealot rose up in 47 BC, and especially since his son, Judas the Galilean (Acts 5:37), led a failed rebellion in AD 6. (See this post for a detailed overview of that movement and its key leaders.) The goal of this movement was to regain for Israel the full independence which had been won by the Maccabees from 164 – 142 BC, but which was lost after Pompey the Great invaded in 63 BC and Herod the Great began to rule over Judea in 37 BC. Their long-planned rebellion finally exploded into a full-scale war around August AD 66, according to Josephus (Wars 2.17.2), and it resulted in Jerusalem being filled with abominations (Wars 2.17.10). I would also like to suggest that the restrainer was, collectively, the Jewish high priests who led the peace movement in Jerusalem. Josephus, in Wars of the Jews, wrote a great deal about how they were a thorn in the side to the Zealots, at times preventing the Zealots from fully doing as they pleased. When the Jewish-Roman War began in AD 66, this peace movement was led by Ananus ben Ananus and Jesus ben Gamaliel. Their long speeches against the Zealots can be seen in Wars 4.3.10 and Wars 4.4.3. Josephus said that Ananus “preferred peace above all things,” was “a shrewd man in speaking and persuading the people,” and “had already gotten the mastery of those who opposed his designs or were for the war” (Wars 4.5.2). In late AD 67 the Zealots appointed a fake and completely unqualified high priest, Phannias, who essentially became their puppet (Wars 4.3.6-8). At this point, the people of Jerusalem “could no longer bear the insolence of this procedure, but did altogether run zealously, in order to overthrow that tyranny…” (Wars 4.3.9). In the speech of Ananus (Wars 4.3.10), he pledged to lead the people in an all-or-nothing attack against the Zealots, not sparing his own body. Ananus and his followers actually gained the upper hand against the Zealots, forcing them into the inner temple and gaining control of the rest of the city (Wars 4.3.12), but their progress came undone because of the trickery of John Levi of Gischala (Wars 4.3.13-14). More details about what happened can be seen in this post. “I should not mistake if I said that the death of Ananus was the beginning of the destruction of the city, and that from this very day may be dated the overthrow of her wall, and the ruin of her affairs, whereon they saw their high priest, and the procurer of their preservation, slain in the midst of their city… to say all in a word, if Ananus had survived they had certainly compounded matters… And the Jews had then put abundance of delays in the way of the Romans, if they had had such a general as he was” (Wars 4.5.2). “[T]he zealots grew more insolent, not as deserted by their confederates, but as freed from such men as might hinder their designs, and put some stop to their wickedness. Accordingly they made no longer any delay, nor took any deliberation in their enormous practices, but made use of the shortest methods for all their executions, and what they had once resolved upon, they put in practice sooner than anyone could imagine…” (Wars 4.6.1). Paul said that once the restrainer was “taken out of the way” (verse 7), “the lawless one [would] be revealed, whom the Lord [would] consume with the breath of His mouth and destroy with the brightness of His coming” (verse 8; NKJV). Do the words “will consume…and destroy” mean that the lawless one would be killed? Or, as John Noe suggested in a 2002 article, is it possible that they meant something other than immediate death? This is an important question to consider as we look at a couple of candidates for the man of lawlessness at the end of this article. The Greek word rendered as “destroy” above is “katargeo.” According to Strong’s Concordance, it means “to be (render) entirely idle (useless), lit. or fig. :-abolish, cease, cumber, deliver, destroy, do away, become (make) of no (none, without) effect, fail, loose, bring (come) to nought, put away (down), vanish away, make void.” The Vine’s entry for this word can be seen here (redirected from here). In Antiquities of the Jews and Wars of the Jews, Josephus wrote about a phenomenon taking place in the Jewish world before and during the Jewish-Roman War, especially in Judea and Galilee. During this time, said Josephus, there were “a great number of false prophets suborned by the tyrants [Zealots] to impose on the people.” Here Josephus described the close working relationship between the Zealots and false prophets. Many of the people, he said, were persuaded “by these deceivers,” who were “such as belied God himself” (Wars 6.5.2-3). Jonathan also “taught the Sicarii to accuse men falsely” (Wars 7.11.2), which was a work of Satan (Revelation 12:10). Other sources could also be called upon, such as “The Zealots” by Martin Hengel, but these citations should be enough to show that the rebellion led by the Zealots was indeed accompanied by deception, lying wonders, magic and tricks, false prophets, claims of signs and wonders, and the working of Satan. “the Lord will consume with the breath of His mouth and destroy with the brightness of His coming” (verse 8). The first one made the temple, including the inner court, his headquarters for about 3.5 years (from the fall of AD 66 until April AD 70). He was killed in Jerusalem in AD 70. That was Eleazar ben Simon. The second one took over the inner court about five months before the temple was destroyed, precisely when the Roman general, Titus, arrived and began his siege against Jerusalem (from April – August AD 70). He was captured, taken to Rome, and sentenced to life in prison. That was John Levi of Gischala. The following is a profile of both of these men and their careers as leaders of the Zealot movement. “They did not ordain Eleazar the son of Simon to that office… because they saw he was of a tyrannical temper; and that his followers were, in their behavior, like guards about him. However, the want they were in of Eleazar’s money, and the tricks by him, brought all so about, that the people were circumvented, and submitted themselves to his authority in all public affairs” (Wars 2.20.3). This was still true almost 1.5 years later, in early AD 68. Josephus said that among the Zealot leaders, he was “the most plausible man, both in considering what was fit to be done, and in the execution of what he had determined upon” (Wars 4.4.1). Eleazar joined forces with John Levi at this time, and, after killing Ananus ben Ananus and other high priests in February-March AD 68 AD, together they seized control of the entire city of Jerusalem (Wars 4.4.1 – 4.6.3). Eleazar made the temple his headquarters for nearly 3.5 years, from late AD 66 until he was defeated by John Levi’s forces in mid-April AD 70. Josephus said that it was “Eleazar, the son of Simon, who made the first separation of the zealots from the people, and made them retire into the temple” (Wars 5.1.2). Around December AD 67, Eleazar and the other Zealots made the sanctuary of the temple “a shop of tyranny” by casting lots to select a fake high priest named Phannias. He was chosen against his will from a village in the countryside, fitted with “a counterfeit face” and the sacred garments, and “upon every occasion [they] instructed him what he was to do” (Wars 4.3.6-8). In the spring of AD 69, Eleazar “was desirous of gaining the entire power and dominion to himself” and he “revolted from John [Levi].” He and his followers “seized upon the inner court of the temple” and made use of the sacred things in there (Wars 5.1.2). At this time, he led one of three Zealot factions, with the other factions being led by John Levi and Simon Bar Giora (Wars 5.1.1, 4; Revelation 16:19). “and admitted such of the people as were desirous to worship God into it. But John made use of this festival as a cloak for his treacherous designs, and armed the most inconsiderable of his own party, the greater part of whom were not purified, with weapons concealed under their garments, and sent them with great zeal into the temple, in order to seize upon it; which armed men, when they were gotten in, threw their garments away, and presently appeared in their armor… These followers of John also did now seize upon this inner temple, and upon all the warlike engines therein, and then ventured to oppose Simon. And thus that sedition, which had been divided into three factions, was now reduced to two” (Wars 5.3.1). “John, who had siezed upon the temple, had six thousand armed men, under twenty commanders; the zealots also that had come to him, and left off their opposition, were two thousand four hundred, and had the same commander that they had formerly, Eleazar, together with Simon the son of Arinus” (Wars 5.6.1.250). Eleazar ben Simon is mentioned one last time in Wars of the Jews. Josephus described the state of affairs as of the 8th of Av (late July or early August) in AD 70 when two of the Roman legions completed their banks. Josephus mentioned that Eleazar was still involved in the fighting at this time: “Of the seditious, those that had fought bravely in the former battles did the like now, as besides them did Eleazar, the brother’s son of Simon the tyrant” (Wars 6.4.1). Eleazar’s death is not mentioned in Wars of the Jews, but there is also no mention of his survival or capture (unlike the other two main Zealot leaders, John Levi and Simon Bar Giora). Various online sources seem to be unanimous that Eleazar died in AD 70 around the time when the temple was burned and destroyed. John Levi was from Gischala in Galilee. Josephus wrote extensively about him in his book, “The Life of Flavius Josephus.” John was not a Zealot from the beginning. At one point, when the people of Gischala wanted to revolt against the Romans, John tried to restrain them and he urged them to “keep their allegiance to [the Romans]. However, Gischala was then attacked, set on fire, and demolished by non-Jews from neighboring regions. At that point, John became enraged, “armed all his men,” joined the battle, but also rebuilt Gischala “after a better manner than before, and fortified it with walls for its future security” (Life 10.43-45). In Wars of the Jews, John was first mentioned in Wars 2.21.1 as “a treacherous person,” a “hypocritical pretender to humanity,” and as one who “spared not the shedding of blood” and “had a peculiar knack of thieving.” According to Josephus, John gathered together a band of four hundred men mostly from Tyre, who were greatly skilled “in martial affairs,” and they “laid waste all Galilee.” These things took place while Josephus was “engaged in the administration of the affairs of Galilee,” beginning around December AD 66, since he had been appointed as a general for the war (Wars 2.20.3-4). Josephus said that John Levi became wealthy through an oil scheme, and he also wanted to “overthrow Josephus” and “obtain the government of Galilee” for himself. He had a number of “robbers” under his command. He spread a rumor that Josephus was planning to give Galilee to the Romans and engaged in other plots against him (Wars 2.21.2), including a murder attempt that Josephus barely escaped (Wars. 2.21.6). “Now upon John’s entry into Jerusalem, the whole body of the people were in an uproar, and ten thousand of them crowded about every one of the fugitives that were come to them, and inquired of them what miseries had happened abroad, when their breath was so short, and hot, and quick, that of itself it declared the great distress they were in; yet did they talk big under their misfortunes, and pretended to say that they had not fled away from the Romans, but came thither in order to fight them with less hazard; for that it would be an unreasonable and a fruitless thing for them to expose themselves to desperate hazards about Gischala, and such weak cities, whereas they ought to lay up their weapons and their zeal, and reserve it for their metropolis. But when they related to them the taking of Gischala, and their decent departure, as they pretended, from that place, many of the people understood it to be no better than a flight; and especially when the people were told of those that were made captives, they were in great confusion, and guessed those things to be plain indications that they should be taken also. But for John, he was very little concerned for those whom he had left behind him, but went about among all the people, and persuaded them to go to war, by the hopes he gave them. He affirmed that the affairs of the Romans were in a weak condition, and extolled his own power. He also jested upon the ignorance of the unskillful, as if those Romans, although they should take to themselves wings, could never fly over the wall of Jerusalem, who found such great difficulties in taking the villages of Galilee, and had broken their engines of war against their walls. These harangues of John’s corrupted a great part of the young men, and puffed them up for the war; but as to the more prudent part, and those in years, there was not a man of them but foresaw what was coming, and made lamentation on that account, as if the city was already undone; and in this confusion were the people…” (Wars 4.3.1-2). Soon after this, Phannias was chosen by lots and installed as a fake high priest and a puppet of the Zealots (Wars 4.3.6-8). Ananus ben Ananus and the other priests shed tears as they watched this mockery take place. Ananus gathered a multitude of the people and gave a speech rebuking them for allowing the Zealots to fill the temple with abominations, plunder houses, shed the blood of innocent people, etc. Ananus said that nothing they could undergo from the Romans would be harder to bear than what the Zealots had already brought upon them. He urged them to rise up together against the Zealots, and said that he was willing to die leading them in that effort (Wars 4.3.10). Ananus and his followers attacked the Zealots and tried to trap many of them in the temple complex (Wars 4.3.12). John Levi pretended to share their opinion and “at a distance was the adviser in these actions.” He consulted with Ananus and other moderate leaders every day and “cultivated the greatest friendship possible with Ananus, but “he divulged their secrets to the zealots.” His deceit became so great that “Ananus and his party believed his oath” to them, and “sent him as their ambassador into the temple to the zealots, with proposals of accommodation” (Wars 4.3.13). John betrayed Ananus and falsely claimed that he had invited the Roman general, Vespasian, to conquer Jerusalem (Wars 4.3.14). In response, the Zealot leaders, Eleazar ben Simon and Zacharias ben Phalek, requested help from the Idumeans, who lived south of Judea, and the Idumeans quickly prepared an army of 20,000 directed by four commanders (Wars 4.4.2). The day they arrived (in late February AD 68) they were prevented from entering the city, but the next day they managed to hunt down and kill Ananus and Jesus (Wars 4.5.2). “But as for John, when he could no longer plunder the people, he betook himself to sacrilege, and melted down many of the sacred utensils, which had been given to the temple; as also many of those vessels which were necessary for such as ministered about holy things, the caldrons, the dishes, and the tables; nay, he did not abstain from those pouring vessels that were sent them by Augustus and his wife; for the Roman emperors did ever both honor and adorn this temple; whereas this man, who was a Jew, seized upon what were the donations of foreigners, and said to those that were with him, that it was proper for them to use Divine things, while they were fighting for the Divinity, without fear, and that such whose warfare is for the temple should live of the temple; on which account he emptied the vessels of that sacred wine and oil, which the priests kept to be poured on the burnt-offerings, and which lay in the inner court of the temple, and distributed it among the multitude, who, in their anointing themselves and drinking, used [each of them] above an hin of them” (Wars 5.13.6). Toward the end of the siege, as Jerusalem was on fire, John joined “the tyrants and that crew of robbers” whose last hope was to hide “in the caves and caverns underground” (Wars 6.7.3; Revelation 6:15-17). Due to great hunger, he surrendered to the Romans, was taken captive, and was “condemned to perpetual imprisonment” (Wars 6.9.4). Among the captives who were carried off to Italy for a triumphal parade, John was considered to be their second leader, after Simon Bar Giora, “the general of the enemy” (Wars 7.5.3, Wars 7.5.6). The Thessalonians were told by Paul that before Christ would come, a rebellion would begin and the man of lawlessness would be revealed (verses 1-3). Paul told them that “the mystery of lawlessness” was already at work in their first century world (verse 7). They were also told that something was restraining it (verse 7) and that they knew what it was (verse 6). Paul kept these details to a minimum in his letter because he was reminding them of what he had already told them in person about these things (verse 5). The man of lawlessness would exalt himself above God, sit “as God” in the temple (verse 4), and his coming would be accompanied by power, signs, lying wonders, deception, and the working of Satan (verses 9-12). However, at the Lord’s coming, the man of lawlessness would be consumed and destroyed (verse 8). The Zealots had been planning a rebellion for about 100 years when Paul wrote his letter, and smaller uprisings had already taken place. Their grand rebellion began in AD 66 and one of their leaders, Eleazar ben Simon, took his place in the temple at that time, even controlling the inner court. Under his watch, many abominations took place, much blood was shed, the sacred temple items were abused, and a fake high priest was installed. When Titus and the Romans arrived in April AD 70, another Zealot leader, John Levi, tricked him and took his place in the inner court of the temple, committing abuses there as well. During and before the rebellion, according to Josephus, the activities of the Zealots and their close partners, the false prophets, were marked by deception, lying wonders, magic and tricks, and the working of Satan. Around August AD 70, John was captured and then given a life sentence in a Roman prison, but Eleazar was killed. 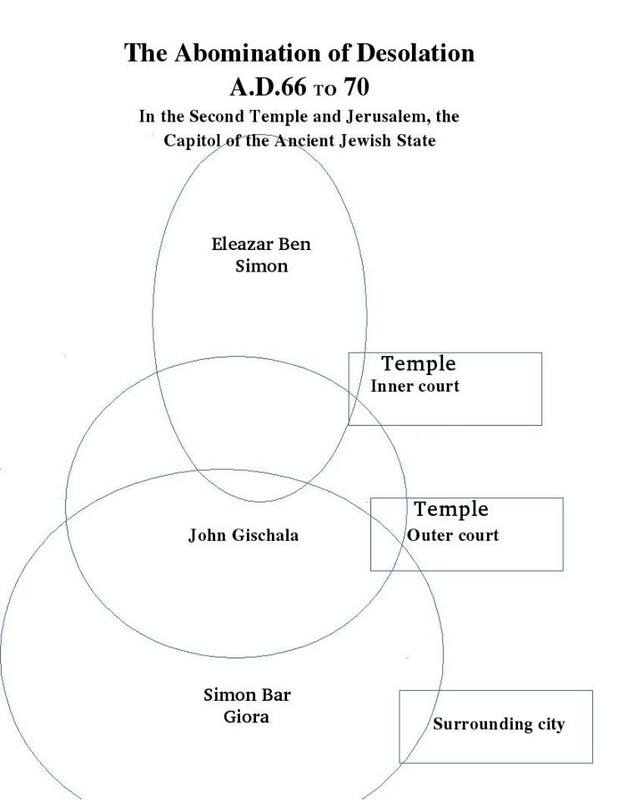 I personally lean toward Eleazar ben Simon being the man of lawlessness because  he made the temple his central command post for the entire first half of the Jewish-Roman War (3.5 years)  he oversaw so many lawless acts in the temple for an extended period of time, and  he was killed at the time of the temple’s destruction. What are your thoughts? A PDF version of this study can be accessed and downloaded here: II Thessalonians 2 and the Man of Lawlessness. This post continues the series, “The Beast of Revelation Was Zealot-Led Israel.” The introduction and outline to this series can be seen here. In the previous post we looked at Revelation 13:3 and the deadly wound of one of the beast’s heads. That post included an extensive overview of the Zealot movement and 12 key leaders of that movement, and I proposed that the seven heads belonged to the family dynasty of Hezekiah the Zealot. I also proposed that the wounded head was Menahem, who came “in the state of a king to Jerusalem” in late August AD 66 and quickly became the leader of the Jewish revolt (Wars 2.17.8). Menahem masterminded a series of victories for the Zealots, had the support of most of Jerusalem’s population (Martin Hengel, The Zealots, p. 363), and was probably “the only man possessing the necessary authority and experience to organize a lasting resistance to the Romans” (Hengel, p. 365). However, he was killed only a month later and many of his followers left Jerusalem and went to Masada. Menahem’s death weakened the Zealots and strengthened the moderate forces who wanted to compromise with Rome. The Zealots achieved a stunning victory over the forces of the Syrian general, Cestius Gallus, who was commissioned by Rome to crush the Jewish rebellion. Eleazar ben Simon and his uncle, Simon Bar Giora, emerged as war heroes – especially Simon Bar Giora who was regarded by many as “their king” (Wars 4.9.4; Wars 7.2.2) just like Menahem was. 1. The beast would be recognized as a victor of war. “Who is able to make war with him?” (Rev. 13:4). 2. The beast would then receive authority to continue for 42 months and overcome the saints (Rev. 13:5-7). 3. The beast would then be captured and killed by the sword (Rev. 13:10). 4. The beast would ultimately end up in the lake of fire (Rev. 19:20) and the birds would be filled with the flesh of his followers (Rev. 19:21). If we examine any historical overview of the Jewish-Roman War (AD 66 – AD 73), what will we see? Who started out victorious but ended up in misery and defeat? Was it Rome, or was it Israel? The reality is that Rome was embarrassed at the beginning of the war, but was thoroughly victorious in the end. Israel shocked everyone at the beginning with its victories, but was brutally destroyed in the end. Israel, not Rome, followed the pattern outlined above. Let’s take a closer look now at those initial victories. According to Josephus, the war officially began in August AD 66 when the governor of the temple, Eleazar ben Ananias, “persuaded those that officiated in the Divine service to receive no gift or sacrifice for any foreigner.” At the same time, 60 miles away from Jerusalem, the Zealots “made an assault upon a certain fortress called Masada. They took it by treachery, and slew the Romans that were there, and put others of their own party to keep it” (Wars 2.17.2). Days later they joined with the Sicarii and burned the house of the high priest (Ananias), the palaces of Agrippa and Bernice, and the city archives (Wars 2.17.6). The next day “they made an assault upon Antonia, and besieged the garrison which was in it two days, and then took the garrison, and slew them, and set the citadel on fire” (Wars 2.17.7). These things took place before the death of Menahem. On the same day that Menahem was killed, the Zealots tricked the remaining Roman soldiers in Jerusalem into laying down their weapons, taking an oath to spare their lives. As soon as the Romans were unarmed, the Zealots violently murdered all of them, except for one person who promised to become a Jew and be circumcised (Wars 2.17.10). This was in September AD 66. For the first time since 63 BC, when Pompey the Great invaded Judea, Jerusalem had no Roman presence. Except for the brief appearance of Cestius Gallus’ armies two months later, it would remain that way for the next 3.5 years until Titus arrived in April AD 70. In the two months that followed the death of Menahem, some of the surrounding nations and cities turned on the Jews who lived among them. Tens of thousands of Jews were killed in Caesarea, Alexandria, Scythopolis, Syria, and other places (Wars 2.18.1-9). The Syrian general Cestius Gallus also came into Galilee with the 12th legion and other Roman forces and began to subdue that nation (Wars 2.18.9-2.19.1). He then approached Jerusalem while the Feast of Tabernacles was taking place. This was in November AD 66 and by this time the people of Jerusalem “were kept under by the seditious” (Wars 2.19.4), meaning that they were under the control of the Zealots. While Cestius Gallus and his forces were still about six miles from Jerusalem, some of the Jews left the feast and preemptively attacked the Romans, killing 515 of them. Only 22 Jews were killed in that battle. Simon Bar Giora also attacked the Roman armies from behind while they were retreating and he “carried off many of the beasts that carded the weapons of war” (Wars 2.19.2). In the end the Zealots “themselves lost a few only,” but killed 5,680 of the Romans. They captured the war engines of the Romans “and came back running and singing to their metropolis,” i.e. Jerusalem (Wars 2.19.9). This is when they “got together in great numbers in the temple, and appointed a great many generals for the war” (Wars 2.20.3-4), and 10 main generals in particular. Rabbi Ken Spiro, a licensed tour guide with the Israel Ministry of Tourism, adds that this expression is both an acronym for “Maccabee” and “the battle cry of the Jewish people.” Attributed to Judah Maccabee around 165 BC, this expression is strikingly similar to the expression used in Revelation 13:4 concerning the beast. It’s very possible that Revelation 13:4 reflected the excited hope that the Zealots were about to obtain full independence for Judea the way the Maccabees did about 230 years before their time. “But for John, he…went about among all the people, and persuaded them to go to war, by the hopes he gave them. He affirmed that the affairs of the Romans were in a weak condition, and extolled his own power. He also jested upon the ignorance of the unskillful, as if those Romans, although they should take to themselves wings, could never fly over the wall of Jerusalem, who found such great difficulties in taking the villages of Galilee, and had broken their engines of war against their walls. These harangues of John’s corrupted a great part of the young men, and puffed them up for the war…” (Wars 4.3.1-2). In the next post we will look at Revelation 13:5-8 and the 42 months that the beast made war with the saints and had authority over every tribe, tongue, and nation. All of the posts in this series can be found at this page. So far in this series we have examined the four kingdoms of Daniel 2, the four beasts of Daniel 7, and the numerous details that Daniel was given about the fourth beast. This included the various roles of the “little horn” that rose up among the 10 horns of the fourth beast. In Revelation 11:7, the fourth beast of Daniel 7 is introduced for the first time simply as “the beast.” It’s translated this way in all 25 versions at Bible Hub. It’s a very sudden introduction, so this should provoke the reader to look back to Daniel 7 to understand this entity’s background. In the next post, we will look at Revelation 11:7 in context, but first I’d like to examine Revelation 11:1-2 which speaks of the holy city, Jerusalem, being trampled by “the Gentiles” for 42 months. Just like the beast, this description is often thought to be about the Romans, but that idea doesn’t line up with history. The Greek word used here for “Gentiles” is “ethnos,” the counterpart of the Hebrew word “goy” in the Old Testament. In the past, I simply assumed that this must be a reference to the Romans who helped destroy Jerusalem and the temple in 70 AD. I marked out 3.5 years from the time that Nero dispatched Vespasian as his war general (early 67 AD) until Vespasian’s son, Titus, oversaw the burning of the temple in August 70 AD. However, the Romans did not trample the city of Jerusalem for 42 months. They only trampled Jerusalem during the 5-month siege of Titus in 70 AD. The Jews successfully kicked the Romans out of Jerusalem in August 66 AD, and they only managed to return to Jerusalem for a few days in November 66 AD when Cestius Gallus unsuccessfully attacked the city. For the next 3.5 years the Romans did not enter Jerusalem. “And this place, which is adored by the habitable world, and honored by such as only know it by report, as far as the ends of the earth, is trampled upon by these wild beasts born among ourselves” (Wars 4.4.3). Source: “Gentiles,” The Universal Jewish Encyclopedia (New York, NY: The Universal Jewish Encyclopedia, Inc., 1941); Volume 4, p. 533. Source: “Gentile,” The Jewish Encyclopedia (New York, NY: Funk and Wagnalls Company, 1905); Volume 5, p. 615. “The land of Zebulun and the land of Naphtali, the way of the sea, beyond the Jordan, Galilee of the Gentiles: The people who sat in darkness saw a great light, and upon those who sat in the region and shadow of death Light has dawned” (Matthew 4:15-16). The three main Zealot leaders (Eleazar ben Simon, John Levi, and Simon Bar Giora) who orchestrated so much bloodshed in Jerusalem were not from Judea. John was from Gischala (Galilee) and Simon was from Gerasa (Wars 4.9.3), which at the time was one of the cities of the Roman Decapolis and today is in Jordan. By the time that Simon “got possession of Jerusalem” in April 69 AD (Wars 4.9.12), he had an army of more than 40,000 people, including Idumeans, who he had gathered from the countryside. The negative views that many Judeans had toward Galileans can be seen in the following Scripture verses: Matthew 26:73; Mark 14:70; John 1:46, 7:52. “Because you have had an ancient hatred, and have shed the blood of the children of Israel by the power of the sword at the time of their calamity, when their iniquity came to an end…” (Ezekiel 35:5). “For three transgressions of Edom, and for four, I will not turn away its punishment, because he pursued his brother with the sword, and cast off all pity; his anger tore perpetually, and he kept his wrath forever” (Amos 1:11). “For your violence against your brother Jacob, shame shall cover you, and you shall be cut off forever. In the day that strangers carried captive his forces, when foreigners entered his gates and cast lots for Jerusalem – even you were as one of them… You should not have stood at the crossroads to cut off those among them who escaped; nor should you have delivered up those among them who remained in the day of distress” (Obadiah 10-14). See this article at the Bible History site for more information on the Edomites and Idumeans. Some of those foreigners were from Hippos, which was “a Greco-Roman city” in the Decapolis that was “culturally tied more closely to Greece and Rome than to the Semitic ethnoi around” (Wikipedia). Josephus said that “the greatest part of [those foreigners] were seditious persons and fugitives, who were of such shameful characters that they preferred war before peace.” Most of the other foreigners were from Trachonitis and Gaulanitis, in the region of Batanea near Persia (Wars 3.10.10). Josephus said that those “foreigners” were fugitives, which means they were on the run. Who and where were they running from? I don’t know. Did some of them also converge on Jerusalem as Galilee, Perea, and other territories were captured by the Romans? There’s another sense in which even the Jews could be described as “the Gentiles.” Among the given meanings for the Greek word “ethnos” are the words “heathens” and “pagans.” In the book of Revelation John certainly describes a great deal of pagan activity happening in Jerusalem. Anyone who reads the descriptions of the Zealots given by Josephus will quickly see that their behavior was lawless, savage, and pagan, to say the least. Several decades earlier, Jesus had denounced the scribes and Pharisees for traveling “land and sea” to win disciples only to make them “twice as much a son of hell” as themselves (Matthew 23:15). Apparently, some of these “sons of hell” made Jerusalem and the temple into their own “shop of tyranny” (Wars 4.3.7). In summary, it was not the Romans who trampled on Jerusalem for 42 months in 66-70 AD. Instead, Jerusalem was trampled by the Zealots, Galileans, Idumeans, etc. They were the Gentiles spoken of in Revelation 11:1-2. We will see more evidence of their trampling as we progress in this study. The next post will examine Revelation 11:3-13 and the two witnesses who were killed by the beast. [G] and prevail against the saints for 3.5 years until the coming of the Ancient of Days and the possession of the kingdom by the saints. The previous post looked at several roles of the little horn (A, B, C, and E), and the majority of this post will look at how he intended to change times and law (F). In this series I am making the case that the fourth beast/kingdom of Daniel and “the beast” of the book of Revelation was Zealot-led Israel. The language used here in this verse certainly fits, considering that Israel was destroyed in the Jewish-Roman War of 66-73, and considering that Jerusalem and the temple were burned with fire (fulfilling Matthew 22:7; II Peter 3:7, 10, 12; Revelation 17:16; 18:8-9, 18; 19:20). This does not fit Rome, which many say was the fourth beast of Daniel and “the beast” of the book of Revelation. Rome was not slain, destroyed, or burned during the Jewish-Roman War, when the kingdom of God was set up (Daniel 2:35, 44; Matthew 16:27-28, 21:43; Revelation 11:15). In fact, the Roman Empire achieved even greater heights during the second century AD. Whereas the fourth beast was slain, destroyed, and burned (Daniel 7:11), the other three beasts lost their dominion but lived on “for a season and a time.” When Babylon was conquered by Medo-Persia in 539 BC, Babylon lost its dominion, but remained as a colony of Medo-Persia. When Persia was conquered by Greece in 330 BC, Persia lost its dominion, but remained as a province of the Seleucid Empire ruled by one of Alexander the Great’s four generals. Greece likewise lived on after the Maccabee victories of 164-142 BC. The principal cities of Babylon, Persia, and Greece were not burned and leveled, their religious systems didn’t collapse, etc. “And thus was Jerusalem taken, in the second year of the reign of Vespasian, on the eighth day of the month Gorpeius [Elul]. It had been taken five times before, though this was the second time of its desolation; for Shishak, the king of Egypt, and after him Antiochus, and after him Pompey, and after them Sosius and Herod, took the city, but still preserved it; but before all these, the king of Babylon conquered it, and made it desolate, one thousand four hundred and sixty-eight years and six months after it was built” (Wars 6.10.1). “For the days will come upon you when your enemies will build and embankment around you, surround you and close you in on every side, and level you, and your children within you, to the ground; and they will not leave in you one stone upon another, because you did not know the time of your visitation” (Luke 19:43-44). “Caesar gave orders that they should now demolish the entire city and temple, but should leave as many of the towers standing as were of the greatest eminency…and so much of the wall as enclosed the city on the west side… but for all the rest of the wall, it was so thoroughly laid even with the ground by those that dug it up to the foundation, that there was left nothing to make those that came thither believe it had ever been inhabited. This was the end which Jerusalem came to by the madness of those that were for innovations; a city otherwise of great magnificence, and of mighty fame among all mankind” (Wars 7.1.1). “And now the Romans, although they were greatly distressed in getting together their materials, raised their banks in one and twenty days, after they had cut down all the trees that were in the country that adjoined to the city, and that for ninety furlongs round about, as I have already related. And truly the very view itself of the country was a melancholy thing; for those places which were before adorned with trees and pleasant gardens were now become a desolate country every way, and its trees were all cut down: nor could any foreigner that had formerly seen Judea and the most beautiful suburbs of the city, and now saw it as a desert, but lament and mourn sadly at so great a change: for the war had laid all the signs of beauty quite waste: nor if any one that had known the place before, had come on a sudden to it now, would he have known it again; but though he were at the city itself, yet would he have inquired for it notwithstanding” (Wars 6.1.1). “…I watched till the Roman Empire was slain, and its body destroyed and given to the burning flame. As for Babylon, Medo-Persia, and Greece, they had their dominion taken away, yet their lives were prolonged for a season and a time” (Daniel 7:11-12; Rome as the fourth beast). It doesn’t work. When the kingdom of God was set up and given into the hands of the saints in the first century (Daniel 2:35, 44; Daniel 7:18, 22, 27; Matthew 16:27-28, 21:43; Revelation 11:15), Rome did not have its dominion taken away at that time. Rome was not burned, slain, or destroyed. The Roman Empire came out of the Jewish-Roman War stronger than it was before the war. That time of kingdom transition was great devastation for Israel, not Rome. “Those great beasts, which are four, are four kingdoms which arise out of the earth. But the saints of the Most High shall receive the kingdom, and possess the kingdom forever, even forever and ever” (Daniel 7:17-18). “I was watching; and the same horn was making war against the saints, and prevailing against them, until the Ancient of Days came, and a judgment was made in favor of the saints of the Most High, and the time came for the saints to possess the kingdom” (Daniel 7:21-22). “But the court shall be seated, and they shall take away his dominion, to consume and destroy it forever. Then the kingdom and dominion, and the greatness of the kingdoms under the whole heaven, shall be given to the people, the saints of the Most High. His kingdom is an everlasting kingdom, and all dominions shall serve and obey Him” (Daniel 7:26-27). In all of this, it’s clear that the downfall of the fourth beast and the 11th horn coincides with the saints inheriting the kingdom of God. As I noted in the introduction to this series, we also see this transition in Matthew 21:42-44. “Jesus said to them, ‘Did you never read in the Scriptures: “The stone which the builders rejected has become the chief cornerstone…?” Therefore I say to you, the kingdom of God will be taken from you and given to a nation bearing the fruits of it. And whoever falls on this stone will be broken; but on whomever it falls, it will grind him to powder’” (Matthew 21:42-44). Israel and Jerusalem suffered defeat and destruction during the Jewish-Roman War (66-73 AD). They were ground to powder by the falling stone of Daniel 2:34-35, 45. Yet out of that tragedy has come the awesome, redemptive, and enduring news that this stone is a great mountain, the kingdom of God. It’s a kingdom that has no end (Luke 1:33). choosing an unqualified and fake high priest who was not of Aaron’s bloodline. The following description by Josephus is quite revealing about what transpired during the Jewish-Roman War due to “the fourth philosophy” of the Zealots. Josephus said that their philosophy spread like an infection as the Jewish revolt blew up into a flame in 66 AD (Wars 2.13.6, Wars 2.14.6). It resulted in the type of great changes described in Daniel 7:25. “[T]he sedition at last increased so high, that the very temple of God was burnt down by their enemies’ fire. Such were the consequences of this, that the customs of our fathers were altered, and such a change was made, as added a mighty weight toward bringing all to destruction, which these men occasioned by their thus conspiring together” (Antiquities 18.1.1). “At the same time Eleazar, the son of Ananias the high priest, a very bold youth, who was at that time governor of the temple, persuaded those that officiated in the Divine service to receive no gift or sacrifice for any foreigner. And this was the true beginning of our war with the Romans; for they rejected the sacrifice of Caesar on this account; and when many of the high priests and principal men besought them not to omit the sacrifice, which it was customary for them to offer for their princes, they would not be prevailed upon. These relied much upon their multitude, for the most flourishing part of the innovators assisted them; but they had the chief regard to Eleazar, the governor of the temple. Hereupon the men of power got together, and conferred with the high priests, as did also the principal of the Pharisees; and thinking all was at stake, and that their calamities were becoming incurable, took counsel what was to be done. Accordingly, they determined to try what they could do with the seditious by words, and assembled the people before the brazen gate, which was that gate of the inner temple [court of the priests] which looked toward the sun-rising. And, in the first place, they showed the great indignation they had at this attempt for a revolt, and for their bringing so great a war upon their country; after which they confuted their pretense as unjustifiable, and told them that their forefathers had adorned their temple in great part with donations bestowed on them by foreigners, and had always received what had been presented to them from foreign nations; and that they had been so far from rejecting any person’s sacrifice (which would be the highest instance of impiety,) that they had themselves placed those donation about the temple which were still visible, and had remained there so long a time; that they did now irritate the Romans to take arms against them, and invited them to make war upon them, and brought up novel rules of a strange Divine worship, and determined to run the hazard of having their city condemned for impiety, while they would not allow any foreigner, but Jews only, either to sacrifice or to worship therein. And if such a law should be introduced in the case of a single private person only, he would have indignation at it, as an instance of inhumanity determined against him; while they have no regard to the Romans or to Caesar, and forbid even their oblations to be received also; that however they cannot but fear, lest, by thus rejecting their sacrifices, they shall not be allowed to offer their own; and that this city will lose its principality, unless they grow wiser quickly, and restore the sacrifices as formerly, and indeed amend the injury [they have offered foreigners] before the report of it comes to the ears of those that have been injured. To be clear, Eleazar ben Ananias was not the same person as Eleazar ben Simon, who was one of the three main Zealot leaders during the first half of the Jewish-Roman War, along with John Levi of Gischala and Simon Bar Giora. Various sources seem to confuse these two Eleazars, and as a result they have attributed certain roles and actions to the wrong person. For example, the Encyclopedia Judaica says that Eleazar ben Ananias was Captain of the Temple “and continued to hold that position until the destruction of the Temple.” This is not true, however, according to Josephus. Around December of 66 AD, Eleazar ben Ananias was named as one of the 10 generals for war against Rome, and he was assigned to Idumea, a region south of Judea (Wars 2.20.4). At this same time, Eleazar ben Simon, the war hero credited with defeating Cestius Gallus, was quickly gaining power in Jerusalem and the people “submitted themselves to his authority in all public affairs” (Wars 2.20.3). Eleazar ben Simon gained and kept control of the inner court of the temple until he was killed at the beginning of the Roman siege in April 70 AD (Wars 5.3.1). Likewise, on page 219 of Final Decade Before the End (a great resource), Ed Stevens cites Hegesippus (110-180 AD) and Yosippon (10th century AD), who say that after “blocking Roman access to the temple,” Eleazar ben Ananias “then seized control of the temple and used it as his fortress…from that point forward” (Heg. 2:10, 5:1; Yos. 61). Hegesippus even claimed that this same Eleazar “was on Masada after the temple was burned” (Heg. 5:53). Here he apparently confuses Eleazar ben Ananias with a third Eleazar – Eleazar ben Jairus, who fled to Masada in September 66 AD (Wars 2.17.9) and later committed suicide there with around 700 others in 73 AD (Wars 7.8.1). The confusion over Eleazar ben Ananias and Eleazar ben Simon is the seventh problem covered by Tal Ilan and Jonathan J. Price in their article, “Seven Onomastic Problems in Josephus’ “Bellum Judaicum” [Wars of the Jews]. They write about the strange disappearance of “Eleazar ben Ananias,” who played such a large role at the beginning of the Jewish Revolt, but is never mentioned again by Josephus. They also write about the sudden appearance of Eleazar ben Simon at this same point in Wars of the Jews. Indeed, both Eleazars are mentioned in Wars 2.20.3-4, one for the last time and the other for the first time. I would like to suggest that the baton of Zealot leadership in Jerusalem was handed off at this time (around December 66 AD) from Eleazar ben Ananias to Eleazar ben Simon. Eleazar ben Ananius was the governor of the temple, (Antiquities 20.9.3, Wars 2.17.2), the second highest position in the temple other than high priest. It’s suggested that he obtained this position in 62 AD. This position was known as “segan” (Aramaic) or “sagan” (Hebrew). According to Rabbi Hanina Segan ha-Kohanim (40-80 AD), “In case the high-priest became unfit for service, the ‘Segan’ [Deputy] should enter at once to do the service” (Talmud, Tractate Sota 42a). Eleazar’s father, Ananius ben Nedebaios, was the high priest from roughly 46-52 AD. He’s the one who commanded Paul to be struck on the mouth during his appearance before the Sanhedrin (Acts 23:2), prompting Paul to prophesy that Ananias would also be struck (verse 3). Ananius also gave evidence against Paul to the governor Felix at Caesarea (Acts 24:1). The Pulpit Commentary says that he “was a violent, haughty, gluttonous, and rapacious man, and yet looked up to by the Jews.” When Eleazar was the commander of the temple, he was anti-Roman, but his father, Ananias was pro-Roman (one of the complaints of the Zealots was that the Herodian dynasty appointed high priests who were sympathetic to Rome). [Eleazar b. Ananius]… being a youth and very stout of heart, saw the evil that Florus did among the people. He sounded the shofar, and a band of youths and bandits, men of war, gathered around him, and he initiated a battle, challenging Florus and the Roman troops [Sepher Yosippon, ch. 59]. Soon after this, Eleazar’s father Ananius was killed by “Manahem, the son of Judas, that was called the Galilean” (Wars 2.17.8-9). Manahem had gone to Masada, broken open king Herod’s armory, stolen arms for his own people and “other robbers,” and “returned in the state of a king to Jerusalem.” Josephus says that Manahem “became the leader of the sedition” (the Zealot movement), but this only lasted for about a month. After Manahem killed Ananias, “Eleazar and his party” avenged his father’s death and killed Manahem. The last time that Eleazar ben Ananias was mentioned by Josephus was in Wars 2.20.4. There it was said that he was appointed as one of the 10 generals of war. He was one of three commanders assigned to Idumea, south of Judea. This was around December 66 AD, soon after the surprising Jewish victory over Cestius Gallus in November 66 AD. 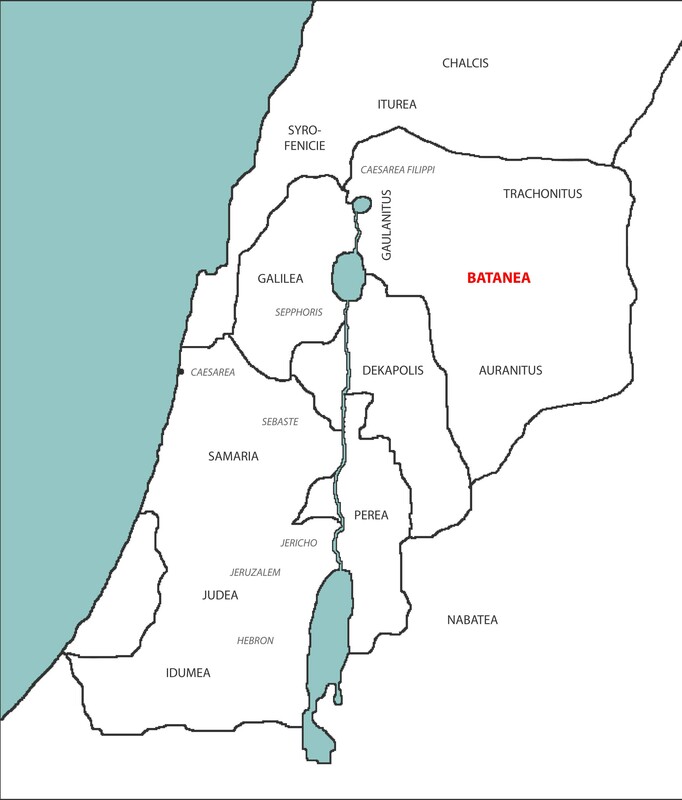 Presumably Eleazar ben Ananias left Jerusalem at this point and took up residence in Idumea. Josephus never mentioned him again. In Wars 4.4.1 Josephus said that Eleazar ben Simon was the main leader of the Zealots at this point. This was in early 68 AD, shortly after John Levi of Gischala, the other main Zealot leader, had fled his hometown and come up to Jerusalem. Josephus said regarding Eleazar ben Simon that he was “the most plausible man” of the Zealot leaders, “both in considering what was fit to be done, and in the execution of what he had determined upon.” Josephus also said that it was “Eleazar, the son of Simon, who made the first separation of the zealots from the people, and made them retire into the temple” (Wars 5.1.2). John Levi joined forces with Eleazar and, after killing Ananus ben Ananus and the other high priests in February-March 68 AD, together they seized control of the entire city of Jerusalem. In spring or summer 69 AD Simon Bar Giora seized control of the upper city of Jerusalem and parts of the lower city. John Levi maintained control of part of the lower city and the outer court of the temple, and Eleazar ben Simon controlled the inner court of the temple. During the first half of the Jewish-Roman War (Fall 66 AD – Spring 70 AD), Eleazar ben Simon was the Zealot leader who controlled the inner court of the temple. His location and position allowed him to oversee and regulate the activities which took place there. “AND now I think it proper and agreeable to this history to give an account of our high priests; how they began, who those are which are capable of that dignity, and how many of them there had been at the end of the war. In the first place, therefore, history informs us that Aaron, the brother of Moses, officiated to God as a high priest, and that, after his death, his sons succeeded him immediately; and that this dignity hath been continued down from them all to their posterity. Whence it is a custom of our country, that no one should take the high priesthood of God but he who is of the blood of Aaron, while every one that is of another stock, though he were a king, can never obtain that high priesthood. Accordingly, the number of all the high priests from Aaron, of whom we have spoken already, as of the first of them, until Phanas, who was made high priest during the war by the seditious, was eighty- three” (Antiquities 20.10.1). These men made the temple of God a strong hold for them, and a place whither they might resort, in order to avoid the troubles they feared from the people; the sanctuary was now become a refuge, and a shop of tyranny. They also mixed jesting among the miseries they introduced, which was more intolerable than what they did; for in order to try what surprise the people would be under, and how far their own power extended, they undertook to dispose of the high priesthood by casting lots for it, whereas, as we have said already, it was to descend by succession in a family. The pretense they made for this strange attempt was an ancient practice, while they said that of old it was determined by lot; but in truth, it was no better than a dissolution of an undeniable law, and a cunning contrivance to seize upon the government, derived from those that presumed to appoint governors as they themselves pleased. Hereupon they sent for one of the pontifical tribes, which is called Eniachim, and cast lots which of it should be the high priest. By fortune the lot so fell as to demonstrate their iniquity after the plainest manner, for it fell upon one whose name was Phannias, the son of Samuel, of the village Aphtha. He was a man not only unworthy of the high priesthood, but that did not well know what the high priesthood was, such a mere rustic was he! yet did they hail this man, without his own consent, out of the country, as if they were acting a play upon the stage, and adorned him with a counterfeit thee; they also put upon him the sacred garments, and upon every occasion instructed him what he was to do. This horrid piece of wickedness was sport and pastime with them, but occasioned the other priests, who at a distance saw their law made a jest of, to shed tears, and sorely lament the dissolution of such a sacred dignity. So the times and the law of the Jews were significantly changed by these actions which Eleazar ben Simon had a major hand in carrying out. If you have any further insights into how the times and law were changed by the little horn, please feel free to share them. In the next post, we will look at how the little horn persecuted the saints for 3.5 years right up until the time that the kingdom was given into their hands. The previous post, “Rome Congratulated Israel on Becoming the Fourth Kingdom of Daniel 2,” concluded our study of Daniel 2. Daniel 7 features another prophetic dream, but this time it was Daniel himself who had “a dream and visions” (verse 1). Whereas Nebuchadnezzar saw a statue with four parts, Daniel saw four beasts. The meaning was the same, though, in that Nebuchadnezzar and Daniel were both shown four kingdoms. It’s the fourth beast (kingdom) which plays a significant role in the book of Revelation. 2 Daniel spoke, saying, “I saw in my vision by night, and behold, the four winds of heaven were stirring up the Great Sea. 3 And four great beasts came up from the sea, each different from the other. 4 The first was like a lion, and had eagle’s wings. I watched till its wings were plucked off; and it was lifted up from the earth and made to stand on two feet like a man, and a man’s heart was given to it. 6 “After this I looked, and there was another, like a leopard, which had on its back four wings of a bird. The beast also had four heads, and dominion was given to it. 19 “Then I wished to know the truth about the fourth beast, which was different from all the others, exceedingly dreadful, with its teeth of iron and its nails of bronze, which devoured, broke in pieces, and trampled the residue with its feet; 20 and the ten horns that were on its head, and the other horn which came up, before which three fell, namely, that horn which had eyes and a mouth which spoke pompous words, whose appearance was greater than his fellows. 21 “I was watching; and the same horn was making war against the saints, and prevailing against them, 22 until the Ancient of Days came, and a judgment was made in favor of the saints of the Most High, and the time came for the saints to possess the kingdom. 23 “Thus he said: ‘The fourth beast shall be a fourth kingdom on earth, which shall be different from all other kingdoms, and shall devour the whole earth, trample it and break it in pieces. 24 The ten horns are ten kings who shall arise from this kingdom. And another shall rise after them; He shall be different from the first ones, and shall subdue three kings. 25 He shall speak pompous words against the Most High, shall persecute the saints of the Most High, and shall intend to change times and law. Then the saints shall be given into his hand for a time and times and half a time. Babylon was the first beast that was like a lion with eagle’s wings. Babylon was also compared to a lion in Jeremiah 4:7, and compared to an eagle in Ezekiel 17:3, 12. Nebuchadnezzar was specifically called a lion in Jeremiah 50:17 (“Israel is like scattered sheep; the lions have driven him away. First the king of Assyria devoured him; now at last this Nebuchadnezzar king of Babylon has broken his bones”). The man with the heart who stood on two feet was most likely Nebuchadnezzar, who brought the Babylonian Empire to its highest height. His heart was “changed from that of a man” to “the heart of an animal” (Daniel 4:16) until he regained his reason (verse 36) and once again had a man’s heart. The plucking of the eagle’s wings could refer to the ceasing of Babylon’s conquests and/or to the humiliation of Nebuchadnezzar and his temporary loss of the kingdom (Daniel 4:31-33). Medo-Persia was the second beast that was like a bear. The fact that it was raised up on one side likely refers to Persia being more dominant than Media. The three ribs could refer to three major territories that this empire conquered: Babylon, Lydia, and Egypt. “Nothing was more swift than the conquest of Alexander, from Illyricum and the Adriatic sea, unto the Indian ocean, and the river Ganges; he rather ran through the world by victories than by battles, and in six years subdued part of Europe, all Asia even unto India” (John Gill’s Commentary on Daniel 7; 1746-1763). This beast’s four heads represented the four generals (Cassander, Ptolemy, Seleucus, and Lysimachus) who oversaw four parts of the kingdom (Daniel 8:22) after the death of Alexander the Great (verse 21). Israel was the fourth beast that was exceedingly strong and had huge iron teeth and 10 horns. As we saw in the last post, in 164 BC the Maccabees secured a great victory for Israel over Antiochus Epiphanes and the Macedonian kingdom. In 142 BC Israel was granted full independence, received congratulations from Rome, and its kingdom expanded. Israel enjoyed this independence for the next 79 years, and was then semi-autonomous all the way up to the Jewish-Roman War. This beast would use its feet to devour, break in pieces, and trample residue. It was different than the three beasts that came before it. A little horn would come up among its 10 horns, would pluck out three of the first horns by the roots, and would have a mouth speaking pompous words. It’s this fourth beast that we will focus on in the rest of our study of Daniel 7. After this part of Daniel’s vision (Daniel 7:1-8) he goes on to learn that the fourth beast would be a fourth kingdom, and it would be slain “and given to the burning flame” (Daniel 7:11, 23). He also learns that the little horn would make war against the saints and “intend to change times and the law” (Daniel 7:21, 24-25). The little horn would prevail against the saints for 3.5 years until the Ancient of Days would come and the saints would possess the kingdom (Daniel 7:21-22, 25-27). We will examine these details one at a time. “The family of Mattathias became known as the Maccabees, from the Hebrew word for ‘hammer,’ because they were said to strike hammer blows against their enemies. Jews refer to the Maccabees, but the family is more commonly known as the Hasmoneans. As we saw in our study of Daniel 2, by 40 BC Herod the Great, the Edomite founder of the Herodian Dynasty in Israel, was doing his own “devouring, breaking, and trampling.” We also saw how Herod divided the land of Israel into five parts, and how after his death his sons divided it further. When we look at Revelation 13 and 17 later in this series, we will examine how the Zealots did all kinds of “devouring, breaking, and trampling” in the land, in Jerusalem, and in the temple complex. How was Israel/Judea, as the fourth kingdom, different than the three kingdoms which preceded it? Like the other kingdoms, the Maccabees (Hasmoneans) expanded their territory by political conquest. Unlike the other kingdoms, the Hasmonean kingdom also expanded through forced religious conversions. I would speculate, though, that the primary difference between Israel/Judea and the other kingdoms was its widespread religious authority. The high priesthood in Jerusalem held authority over Jews living in “every nation under heaven” (Acts 2:5), some of whom would travel to Jerusalem three times a year for the major festivals (Passover, Weeks/Pentecost, and Tabernacles). Daniel observes that the fourth beast had 10 horns (verse 7). In verse 20 Daniel asked about those 10 horns and it was revealed to him that they “are ten kings who shall arise from this kingdom” (verse 24). Daniel wasn’t told anything else about those 10 horns, but in Revelation 17:12-17 John learns that they  would “receive authority for one hour as kings with the beast”  would “give their power and authority to the beast”  would make war with the Lamb but be overcome by the Lamb  would “hate the harlot, make her desolate and naked, eat her flesh and burn her with fire”  and would “give their kingdom to the beast until the words of God are fulfilled.” We’ll examine the 10 horns in more depth later in this series when we come to Revelation 17. “But the hatred that John, the son of Levi, bore to me, grew now more violent, while he could not bear my prosperity with patience. So he proposed to himself, by all means possible, to make away with me; and built the walls of Gischala, which was the place of his nativity. He then sent his brother Simon, and Jonathan, the son of Sisenna, and about a hundred armed men, to Jerusalem, to Simon, the son of Gamaliel, in order to persuade him to induce the commonalty of Jerusalem to take from me the government over the Galileans, and to give their suffrages for conferring that authority upon him” (Life of Flavius Josephus, 38 ). Soon afterward, though, Josephus had a dream in which he was told that John’s schemes against him would not succeed and that he would live to fight the Romans (Life, 42). John Levi eventually made it to Jerusalem in November 67 AD (Wars 4.2.4), and before long he was able to seize control of part of the city. Daniel 7:8 states that “before” (i.e. in front of) the little horn “three of the first horns were plucked out by the roots.” Verse 20 says that they “fell,” and verse 24 says that the little horn would “subdue” them. Ananus was killed in early 68 AD when the Zealot leaders tricked the Idumeans into coming up to Jerusalem. This happened after John of Gischala first pretended to befriend Ananus, who was vehemently against the Zealots and their war agenda. Ananus was the leader of “the moderates,” those who took a moderate position regarding Rome. With false pretenses, John discussed plans with Ananus and then secretly passed them along to the other Zealot leaders. He also lied to the Zealots and claimed that Ananus was plotting to invite the Roman general Vespasian to take over Jerusalem (Wars 4.3.13-14). So John convinced Eleazar ben Simon and the other Zealots to help him send a letter to the Idumeans (south of Judea), urging them to come up to Jerusalem and defend the city (Wars 4.4.1). An army of 20,000 Idumeans, led by four commanders (see Revelation 9:13-17) then came up to Jerusalem (Wars 4.4.2). Together with the Zealots, they killed thousands of people, filling the outer court of the temple with blood (Wars 4.5.1). They then specifically hunted down the high priests and killed Ananus, among others (Wars. 4.5.2). When the Idumeans left Jerusalem, Josephus says that the Zealots thirsted “chiefly after the blood of valiant men, and men of good families; the one sort of which they destroyed out of envy, the other out of fear; for they thought their whole security lay in leaving no potent men alive; on which account they slew Gorion*, a person eminent in dignity, and on account of his family also… Nor did Niger of Peres escape their hands… so did they slay him” (Wars 4.6.1). In Wars 4.3.9 we read about “Gorion the son of Josephus” growing tired of the Zealots and opposing them. The footnote above states that this is the same person. This makes sense because Josephus had already named Nicodemus as the actual father of Gorion. According to Martin Hengel, author of “The Zealots” (p. 367), Josephus had a habit of stating names differently and changing them around in his works. Then in Wars 4.6.1 he speaks of the death of “Gorion” at the hands of the Zealots. As the footnote states, this must be the same Gorion (or “Joseph the son of Gorion”) mentioned just a little bit earlier in Wars 4.3.9. In the October 1993 – January 1994 edition of the Jewish Quarterly Review (University of Pennsylvania Press, pp. 189-208), Tal Ilan and Jonathan J. Price published an article titled “Seven Onomastic Problems in Josephus’ “Bellum Judaicum” [Wars of the Jews]. Ilan and Price highlighted this same problem (#6) and seemed to come to the same conclusion. So far, outside of Wars 4.6.1 and the footnote for Wars 2.20.3, I have been unable to find any other record of how or when Joseph ben Gorion, the governor of Jerusalem, died. If anyone has such information, please do share it. It would be good to have an even stronger confirmation that Josephus was speaking of the same person, despite the name getting switched around. So, from the list of 10 generals (10 horns) above, the three horns who were killed by the Zealots were #1, #2, and #5. All three were killed in Jerusalem. These harangues of John’s corrupted a great part of the young men, and puffed them up for the war; but as to the more prudent part, and those in years, there was not a man of them but foresaw what was coming, and made lamentation on that account, as if the city was already undone; and in this confusion were the people” (Wars 4.3.1-2). On this point, there seems to be more evidence pointing toward John as the little horn. As we consider all the points collectively, each reader can look at the evidence and decide whether Eleazar, John, or even another individual best fits the descriptions that Daniel was given. In the next post, we will continue to look at Daniel 7 and other details concerning the little horn.